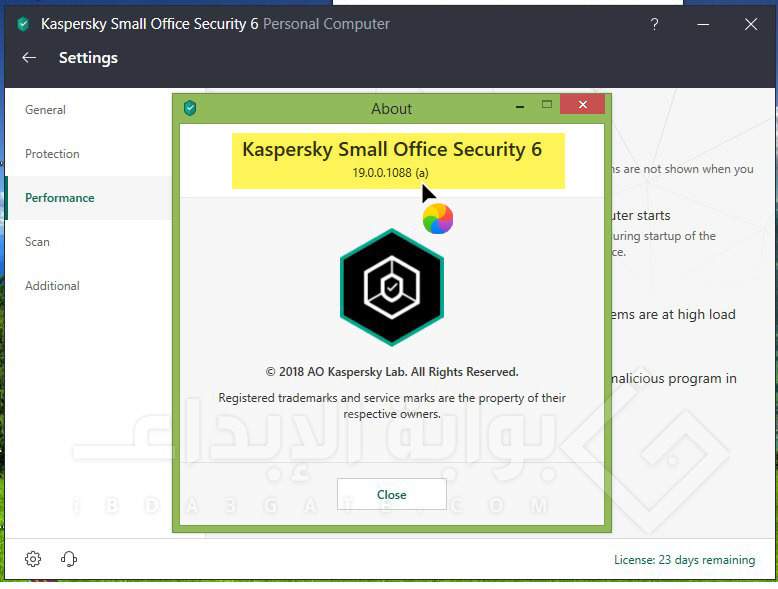 أقدم لكم اخوانى الكرام أحدث إصدار من عملاق الحماية Kaspersky Small Office Security 6 19.0.0.1088a هذا الإصدار المخصص للشركات والتى يتميز بخفة وسرعة فائق وحماية على أعلى مستوى . صُمم Kaspersky Small Office Security للشركات التي تُشغِّل 5-50 حاسوبًا وبعض الخوادم والأجهزة المحمولة. ويعمل بشكل مباشر ويُدار من وحدة تحكم سهلة الاستخدام مستندة إلى السحابة، بدون الحاجة إلى توفر مهارات في تكنولوجيا المعلومات لاستخدام أدوات الأمن الفعّالة التي نقدّمها ومراقبة الأمن من أي جهاز متصل من اختيارك. تعمل إمكانات مكافحة برامج التشفير الضارة (Anti-cryptor) على إيقاف هجمات قفل التشفير وبرامج الفدية في مهدها. وتُشغِّل محاولات التشفير الضار النسخ الاحتياطي والاسترداد التلقائي. قم بتأمين البيانات الحساسة وحماية شركتك من انتهاكات البيانات والغرامات وفقدان معلومات الشركة باستخدام النسخ الاحتياطي والتشفير. امنع برامج التجسس والتصيد الاحتيالي وروابط الإنترنت الضارة من سرقة شركتك. وقم بتأمين نشاط البريد الإلكتروني والويب من محاولات الاستغلال والبرامج الضارة الخفية. يحمي Kaspersky Small Office Security أموالك وأرقام بطاقات الائتمان وتفاصيل الحسابات المصرفية. إن تحسين أداء البرامج واستهلاك موارد الحاسوب يمنحك تدفقًا أكثر فعالية لحركة المرور وأوقات تحميل أسرع على الويب إلى جانب تحسين عمليات النشر والتحديثات ووقت بدء التشغيل. احمِ الهواتف الذكية والأجهزة اللوحية التي تعمل بنظام Android باستخدام تقنيات أمن الأجهزة المحمولة وإدارتها. فمن خلال ميزات قفل الأجهزة المفقودة ومسح البيانات الموجودة عليها وتحديد موقعها، يحمي Kaspersky Small Office Security المعلومات الحساسة الموجودة على الأجهزة التي يملكها الموظف. 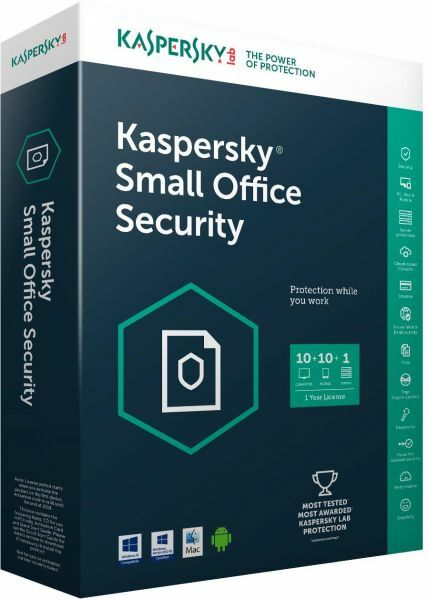 ولكنى أقدمه مجاناً لمدة 30 يوم قانونى بلا حدود ..
Kaspersky Small Office Security provides comprehensive protection against various types of information threats, network and fraudulent attacks, as well as spam. Kaspersky Small Office Security provides various functions and protection components for solving complex protection tasks. Each type of threat is processed by a separate protection component. You can turn on and off protection components, as well as customize their work. In addition to the real-time protection implemented by the protection components, it is recommended that you periodically scan your computer for viruses and other threats. This should be done in order to exclude the possibility of the spread of malicious programs that were not detected by the protection components, for example, due to the low level of protection installed or for other reasons. To keep Kaspersky Small Office Security up to date, you need to update the databases and program modules used in the program. Some specific tasks that need to be performed occasionally (for example, eliminating traces of user activity in the operating system) are performed using additional tools and wizards. • Added notification from Web Anti-Virus about pages with adware and other legal programs that could be used by intruders to harm the computer or your data. • Added protection against infection during the restart of the operating system. • The ability to switch from the Licensing window to the Portal Management Center of Kaspersky Small Office Security has been added to view information about the activation code. • Added the ability to enter a new activation code if the subscription has expired. • Improved Tools window. The program's functions are grouped into categories, so that it is more convenient for you to find the necessary functionality. • Improved computer cleaning component. - Now you can complain about a program that behaves in an undesirable way. - Added search and delete browser extensions. - Added schedule for finding programs and browser extensions. - Added the ability to exclude programs from the analysis by categories of objects. - The list of ignored programs is moved to a separate window. - Added the ability to search for program updates on a schedule. notifications and from the taskbar. - Improved feedback forms with which you can assess the quality of the component and create a request to the Support Service. - Added notification about whether your computer supports hardware virtualization. Also, the status of hardware virtualization is displayed in the component settings window. - If you change the time zone, the counter of the spent time using the computer, the Internet and programs is reset. - Similar programs, for example, Internet browsers from different manufacturers, are now controlled as one application. • Improved operation of the Anti-Banner component. New Anti-Banner filters have been added, with the help of which you can specify which particular banners to block. • Improved display of notifications. Notifications that are not critical for the work of the program are not displayed when you are working in office applications, launch the program in full-screen mode, watch a video or make a video call. • Improved Recommended settings window. The "Delete possibly infected objects" checkbox and the "Detect other programs that can be used by attackers to harm the computer and user data" option has been added. • Added check scripts using the Antimalware Scan Interface (AMSI). AMSI is a standard Microsoft interface that allows you to scan scripts and other objects using Kaspersky Small Office Security. The component can only detect and notify about the threat, but not handle the threat. The component is available starting with the Microsoft Windows 10 operating system. • Improved Check secure connections. Now you can select actions for sites with validation errors and add these sites to exceptions. • Added the ability to disable the decryption of EV certificates (Extended Validation). • The Activity Monitoring component has been added when installing the program on a file server. Previously, Activity Monitoring was available only when the program was installed on a personal computer. نقوم بتحميل البرنامج حسب اللغة التى تريدها ونثبت البرنامج بشكل طبيعى ونقوم بتفعيل الفترة التجريبية لمدة 30 يوم وقبل إنتهاء الفترة التجريبية نستخدم الباتش المرفق لإعادة الفترة التجريبية مرة أخرى بسهولة والأن مع صور من داخل البرنامج ..
ونضغط على إعادة الفترة التجريبية فقط كما موضح ..
ليقوم بإعادة الفترة التجريبية وإعادة تشغيل الكمبيوتر لنقوم بالتفعيل 30 يوم مرة أخرى . من البرنامج فى هذا الموضوع ..
وفى إنتظار تجربتكم للبرنامج الرائع بإذن الله ..
أداة إعادة الفترة التجريبية المستخدمة بالشرح KRT CLUB 2.0.0.35 ومتوافقة مع جميع إصدارات Kaspersky ويمكن من خلالها إعادة الفترة التجريبية للبرنامج لمدة 30 يوم بلا حدود ذلك تمكننا من إدخال التراخيص بصيغة .lic بسهولة فقط تحتاج إلى خطوات الشرح بالأعلى . حصرياً لإعادة الفترة التجريبية وتفعيل كاسبرسكاى KRT CLUB 2.1.2.69 بجميع منتجاته .